Inferior Vena Cava (“IVC”) filters are cone-shaped medical devices used as an alternative treatment option for patients with contraindications to anticoagulation, commonly known as blood thinners. Just as an anticoagulation, IVC filters are presumptively designed to trap and dissolve blood clots before they cause a life-threatening medical condition known as Pulmonary Embolism. Pulmonary Embolism is an obstruction of a blood vessel in the lungs, usually due to a blood clot, which blocks a coronary artery. IVC filters are also placed in patients who are diagnosed with deep vein thrombosis (DVT), pulmonary embolus, trauma victims, and patients who are immobile, all of which who are at risk of developing blood clots in the legs. The IVC filter is surgically implanted into a patient’s inferior vena cava (or posterior vena cava), one of two large veins that carry deoxygenated blood from the lower body to the heart. Unfortunately, these vascular filter medical devices have been the subject of wide criticism as there have been high rates of potentially life-threatening fracture and embolization (blockage-causing material) associated with IVC filters. In 2010, the US Food and Drug Administration (FDA) issued a safety communication after reviewing the adverse events database, which reported 921 adverse events related to IVC filters since 2005. At the time, these filters were considered Class II by the FDA, which is the same risk category of mercury thermometers, yet received FDA approval without any clinical data of safety and effectiveness identified in their 510(k) clearances. The widely recognized complications from IVC filter placements have included erosion through the vena cava wall, visceral perforation, and filter thrombosis, obstruction, and migration. In other words, the filters may migrate to the lungs or heart, or fracture, and leave shards or particles that can puncture and tear internal organs, causing serious injury or death. Between 2005 and 2014, an estimated 1.13 million patients underwent implantation of an IVC filter. The implantation rate saw a 22% increase from 2005 to 2010, but has declined 29% from 2010 to 2014 after a recall from one of the leading manufacturers, Bard Medical. Both Cook Medical and Bard Medical are primary manufacturers of the IVC filters. As such, both companies have faced a number of lawsuits. More than 10,000 cases involving IVC complaints have been filed nationwide in both state and federal courts, the vast majority naming Cook Medical and Bard Medical as defendants. If you or a loved one have undergone IVC filter implantation, notify a personal injury attorney at Rosensteel Fleishman, PLLC to discuss possible injury claims, damages, and compensation. A report provided by the US National Library of Medicine (NLM), observed that all the filters identified on the CT scans showed some degree of vena cava perforation after 71 days of placement, and 40% were tilted. Because of recent research and FDA safety alerts, cases are being investigated for patients who had the device removed due to complications or patients who currently have an IVC filter implanted (with or without complications). As a result of the research and findings, many of the lawsuits claim IVC filter manufactures designed a defective device and failed to properly warn patients and doctor of their known risks. In Indiana, a federal jury awarded $3 million in a bellwether case (a consolidated multi district litigation) involving Cook Medical’s IVC filter injuries. The case involved a woman who was implanted with a Cook Celect Filter in March 2009 with no complications, according to her complaint. Two years later, she suffered several complications, including a painful area inside her right thigh that developed into a protrusion. The protrusion eventually popped and a metal wire was discovered. The wire was determined to be one of the struts from the Cook IVC filter. X-rays revealed that the remaining struts of the IVC filter broke and ruptured her internal organs, and as a result, additional surgeries were needed in an attempt to have the filter removed. The plaintiff underwent multiple unsuccessful surgeries, which were eventually halted. The plaintiff sued Cook Medical and other associates claiming strict liability, failure to warn, design defect, negligent manufacturing, negligence per se, breach of warranty (express and implied), and loss of consortium. The U.S. District Judge Richard L. Young granted Cook Medical summary judgment on several claims, but the jury returned a verdict that covered liability and compensatory damages; no punitive damages were awarded. Similarly, in Houston, Texas, a suit was filed against Cook Medical for their IVC filter that became stuck inside a man’s body, tilted, and lodged in his duodenum and a renal vein. The complications required three removal procedures and an open laparotomy surgery to remove the filter. To remove the IVC filter, the metal filter had to be cut into several pieces and dug out, leaving the thirty-five (35) year old man with a 16-inch surgical scar. He now faces a 90% chance of suffering spinal stenosis, which can cause severe pain, numbness, and muscle weakness. As such, Cook Medical was ordered to pay $1.2 million in damages. The majority of IVC filters were not designed for permanent implantation, and just as the FDA report stated, the devices should be retrieved, if at all possible, once the risk of Pulmonary Embolism has subsided. Note, however, that many of the complications have asymptomatic presentation and therefore the true complication rates are likely under-reported. The Society of Interventional Radiology and the Society of Vascular Surgery are in the process of a study which will glean a prospective, multicenter, clinical trial aimed at addressing the safety and effectiveness of IVC filters. For now, because of the high risk of side effects or complications associated with IVC filters, you or a loved one may be entitled to seek recovery. 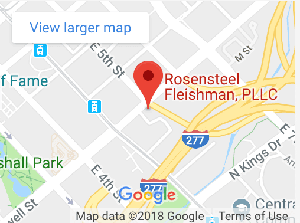 Contact the dedicated attorneys at Rosensteel Fleishman, PLLC to review your case and discuss the potential to pursue personal injury claims against the manufacturer of a defective IVC filter. Please call as at (704) 714-1450. You will speak with a personal injury lawyer who can answer your questions and go over your options. There is no fee for the initial consultation.